Well, I have been busy, busy, busy. Well, at least, I’ve been keeping my hands busy. I’ve been doing a lot of sitting, lately, and apparently that translates to a LOT of crocheting. 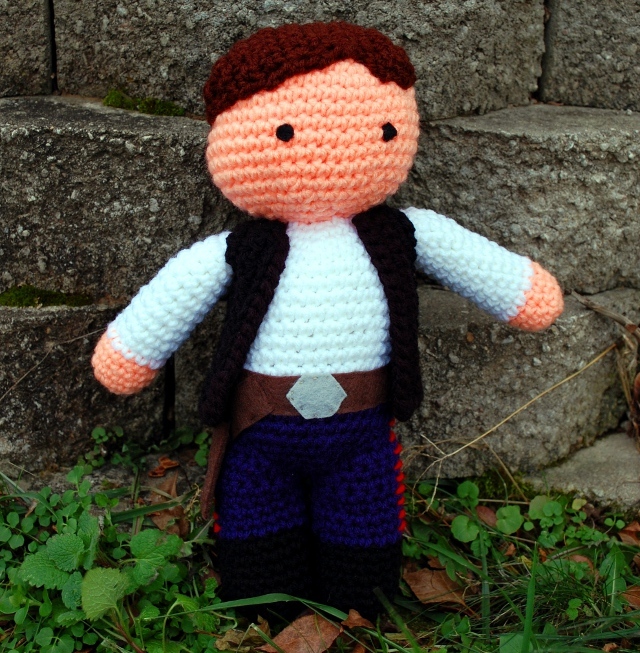 First up: Tommy has been begging for a Han Solo toy. Begging. And I’ve got him finished, written up, and wrapped for Christmas. Pick up your copy here, if you’re so inclined. 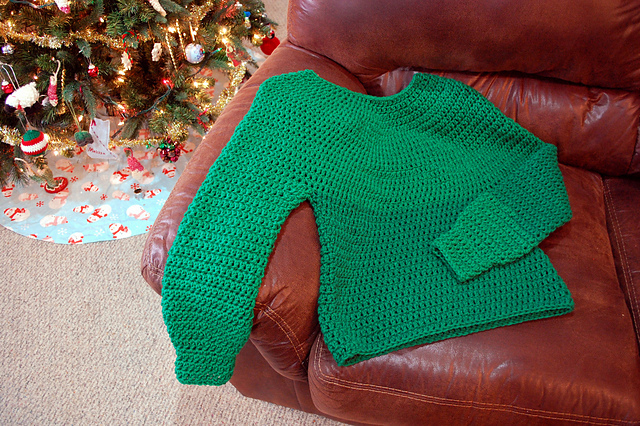 Second, Greg has been plotting his sweater for the annual Ugly Sweater Contest for a year. I kid you not. Since the party is next week, this takes priority over some Christmas presents that need to be…um…started still. Good thing I designed that thing to be quick! Eesh. No dye lots, huh? I’m thinking they’re full of it on that score. Anyway, I followed the same directions as last year, except I used increases instead of chains in rows 3 and 5, and added three extra rows of dc and a border of sc to the end of the sleeves…he needed a little extra length since his arms are going to be up a lot this time. Intrigued? Stay tuned. …using this pattern. I used some Softee Baby and an F hook, and started with 40 chains. Otherwise, I made it to measurements. …using this pattern, and I have to say, I really love it. The shaping on it is intricate, but the results are fantastic! It’s very stretchy. I was going to give it as a gift, but 1) I love it, and 2) the Lion Brand Fisherman’s Wool I used is pretty scratchy. I don’t know if the recipient I had in mind would like it. Not as much as I do, anyway. Then the last thing I’ve been working on is a pair of Thuja I’ve been knitting to remind myself how to make socks, but I haven’t taken a picture yet of the 1.2 socks I’ve knit so far. Maybe when I finish them! Although, with Christmas coming up so fast, I’m not sure when I’ll be able to get back to them.